The Abyssal Sire is an Abyssal Demon boss found in the Abyss. 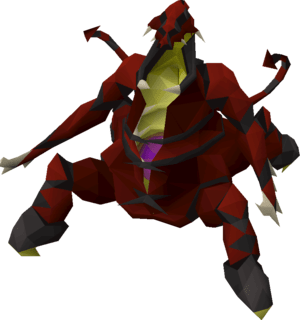 The Abyssal Sire can only be fought while on a slayer task for Abyssal Demons or a boss task for the Abyssal Sire and has a slayer level requirement of 85. The Abyssal Sire is a popular boss, especially among Ironmen as the Sire is the only source of the Abyssal Bludgeon. – a very powerful crush weapon. The most common tactic to use at Sire is a combination of melee and ranged, and potentially ancient magicks. The Abyssal Sire is not a very difficult boss although there are some mechanics you will need to learn. You should begin the fight by equipping your Ranged gear and attacking the Sire. The Sire and the tentacles will now awake. You should now cast ‘Shadow Barrage’ on the Abyssal Sire to instantly put him to sleep. This will allow you to now kill all four respiratory systems around the room. If the Sire wakes up while you’re still killing the respiratory system, re-cast ‘Shadow Barrage’ to put him back to sleep. Once all four respiratory systems are killed you should return to the centre of the room, equip your melee gear and prepare for phase 2. During Phase 2 you should use the protect from melee prayer and utilise your special attacks. Now you should do as much damage as possible while avoiding the poison puddles that the Sire will spawn at your feet. You need to move at least two squares away from these puddles to avoid taking massive amounts of damage. Once the sire is at 50% health, you should prepare for phase 3. During phase 3 the Sire is going to start spawning minions as well as spawning poison puddles at your feet. You need to stand within melee range and dance back and forth between two tiles, at least two squares away from each other. In this manner you can attack once every time you move, allowing you to keep your DPS high while avoiding the poison puddles at your feet. If the minions start to deal too much damage and you need to heal, you should take a few steps back to allow the minions to bunch up together, and hit them with ‘Blood Barrage’. This should provide a good amount of health and you can then return to the Sire. The very last attack you need to deal with is an AoE explosion. Once the Sire is below 139 health, we will instantly teleport the player beside him and open up, ready to explode. You now have two game ticks to move at least two squares away to avoid taking massive damage. After the Abyssal Sire has exploded you can return to attacking him, until he teleports you again, at which point you should repeat the process again until he is dead.